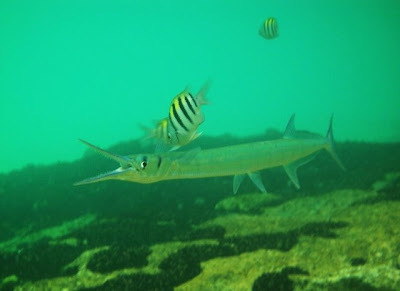 The needlefish in the picture below is being cleaned by Sergeant Majors (Abudefduf saxatilis). Needlefish signal fish that they are ready for cleaning by opening their mouths. The cleaner fish even pick around their patients teeth but do not have to worry about being eaten. The needlefish that I watched being cleaned only stayed for a few seconds at a time but groupers are known to stay at cleaning stations for up to an hour. Unfortunately I had the camera on macro and couldn't change the setting fast enough for this shot but I played with the contrast and light levels on the computer and made the picture a lot clearer.